This Daily Agenda Printable is the cornerstone of my planner. I fill a week’s worth out each Sunday and they are easy at hand for jotting down notes of things that need to be done this week. 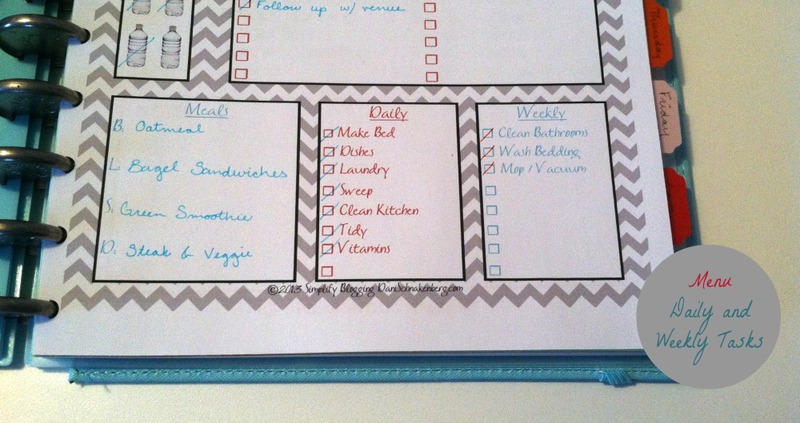 If you’re a chronic list-maker like me, you’re going to love this! I’m a weirdo and keep a planner that is just the current week. I have a main calendar tab that goes further out and then a tab for each day of the week and a “later” tab. One of these sheets goes in each weekday section along with any other client sheets or anything that needs taken care of that day. This system works magically for me because everything I need for each day is right there together without a lot of other fluff to get distracted by. As a work at home mom with little kids and a busy husband, I love having work and home all in one place. The “Today’s Top 5” section helps me prioritize. If I get nothing accomplished except those tasks, it’s a good day. It keeps me from making an overboard list and feeling down when I don’t get all 30 things done. Anyone else have that bad habit? I keep all of my appointments in my iCal on my laptop, iPad, and iPhone (with LOUD reminders), but writing them down here ensures that I don’t forget any client worksheets or notes I made about things to ask those people. And water intake! I’m a goal-oriented person. I get giddy about crossing things off, including those little water bottles. If that’s what works to keep me hydrated, I’ll take it! And then there’s the hand household boxes across the bottom. Again, I like to cross things off! You have the same planner that I have. 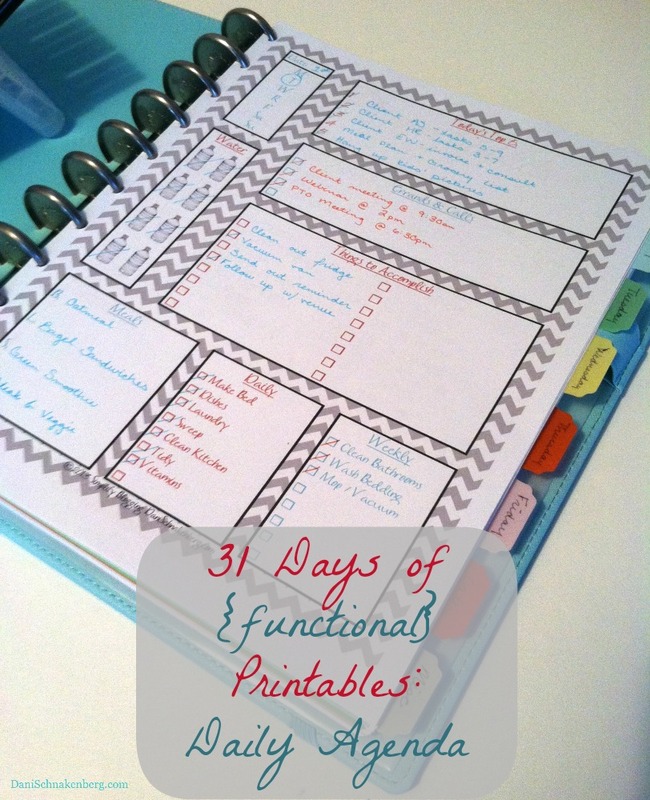 Have you found a way to adjust printables (that are formatted to 8 1/2 x 11) to fit in our size planner? Many thanks for all you’re doing! Wanda, mine is actually the larger one, so the 8.5 x 11’s fit perfect. When I was using a mini-3-ring though, I either printed it using the booklet setting or resized it in Photoshop. darn! I’ll try the booklet setting! Thanks for the tip. I’m feeling like I might should have gotten the larger one but I really wanted it to fit in my purse. Hmmmm….we’ll see! Thanks for the quick reply! I LOVE THIS! And I made the picture! 🙂 Or at least my initials did! haha! Awesome– thank you! I am going to print these when I get home from work!! Enjoy! 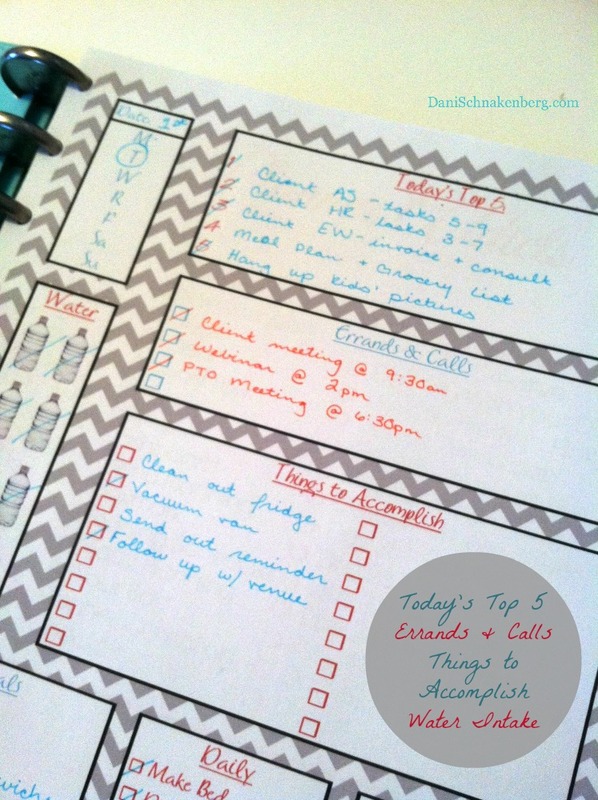 I think every blogger and most moms should use a daily page! It helps you focus so much better! This is great! Is there a way to edit the items on the daily list to show my daily “need to do’s”? What planner do you use? For 2015 I have picked up a Whitney English Day Designer and am absolutely loving it!